Quite some time back I was mentioned this book. I just shrugged it off as another self-help book – a category I completely despise. Recently after updating the OS on my IPad, I was checking my e books inventory and located this book. I started reading the first few pages and it caught my complete attention. It seemed an interesting book and one page led to another, finishing the book. A complicated subject like Habits and why we do what we do, is explained in a simple, elegant, easy to understand manner. Making the whole book full of anecodetes makes the reading more enjoyable. It seems less like a heavy psychological book (which it is not) and more like a good non-fiction read. Human habits seem uncontrollable and unexplained and we assume that they exist to remain permanently fixed in our brains. “They are so strong, in fact, that they cause our brains to cling to them at the exclusion of all else, including common sense,” the author wirtes. But it turns out our habits are quite malleable, and as the author shows, companies are getting ever more adept at identifying, co-opting, and shaping our behavior patterns to increase profits. The Cue (instigator of an action), then the routine (the action itself) followed by the reward (gratification resulting from the action) is the habit loop that is mentioned throughout the book elucidated with live examples. Companies leveraging on this habit loop and successfully managing to create a dent on this emerge out successful. Charles Duhigg writes a book on a complicated subject in a pretty lucid manner taking it to the larger public and turning it into a bestseller. 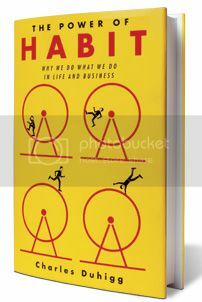 Overall, “The Power of Habit” is an enjoyable book, and one can find useful advice on how to go about changing at least some of our habits.